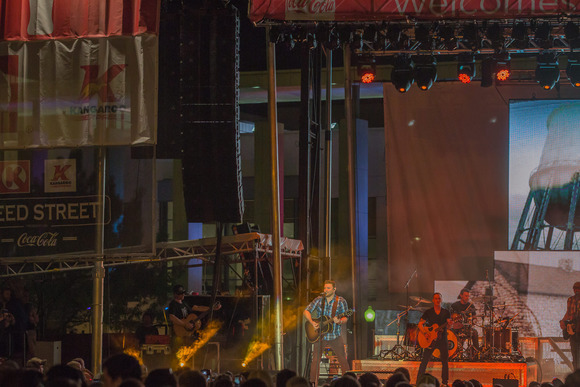 CHARLOTTE, N.C.—JBL by HARMAN VTX Series line arrays recently helped JHE Production deliver the highest quality live sound at Circle K and Kangaroo Speed Street presented by Coca-Cola. The 22nd annual festival was held in conjunctionith the Coca-Cola 600 weekend at Charlotte Motor Speedway and featured a stellar lineup of top country music artists, including Montgomery Gentry, Chris Young, Kellie Pickler and The Band Perry. In order to provide the highest quality audio and meet the challenges of setting up a mobile stage in the middle of the city, JHE selected JBL VTX V20 for its clean and transparent sound, ease of deployment and exceptional coverage. Circle K and Kangaroo Speed Street presented by Coca-Cola featured two nights of performances by some of the biggest stars in country music. The primary goal for many of the touring engineers was to ensure that the vocals sounded great and sat on top of the mix. However, with multiple acoustic and electric instruments being played on stage simultaneously, it was challenging to achieve a clean and upfront vocal mix. The high output and transparent sound quality of the VTX V20 enabled JHE Production to meet this challenge, and the engineers and artists alike were impressed with the sound quality at the festival. Since the festival essentially took place in the middle of Uptown Charlotte, it was important for JHE Production to deploy and configure the system quickly. The system also needed to be compact and lightweight to meet the size and weight restrictions of the mobile stage. VTX V20 is equipped with a new suspension system that provides efficient transport, fast setup and precise configuration, enabling JHE Production to get the system up and running fast. JHE Production also deployed a Soundcraft Vi7000 mixer and Crown VRack power amplifiers at the festival, and used JBL HiQnet Performance Manager 2.0 software to configure the entire system. The selection of HARMAN live sound solutions provided seamless integration and delivered exceptional performance for the festival. The JBL VTX V20 delivers advanced technology and extraordinary performance in a small format, high power density 3-way system. All VTX V20 components have been specifically engineered to provide stable 105-degree horizontal coverage and effective line source array coupling in the vertical plane while delivering linear, transparent sound up to surprisingly high output levels for its diminutive size. JBL's exclusive dual voice coil, dual magnetic gap Differential Drive technology is at the core of all VTX models, dramatically reducing driver weight while greatly enhancing all critical performance parameters: frequency response, power output and distortion. Founded in 1987, JHE Production is an award-winning event production company specializing in live shows, experiential activation, special and corporate events. For more information, visit www.gojhe.com.